Towns so far represented, anyone can take the survey … Acton, Andover, Belmont, Boston, Brookline, Burlington, Braintree, Bridgewater, Foxboro, Framingham, Georgetown, Grafton, Haverhill, Holliston, Hopkinton, Kingston, Leominster, Mansfield, Marion, Marlborough, Maynard, Methuen, Needham, Newton, Northborough/Southborough, Northbridge, Pentucket Regional, Plainville, Quincy, Reading, Triton, Tyngsboro, Uxbridge, Wachusett, Wareham, Westwood, Wilmington, Winchester, Woburn. Here is the aggregate data to date. Note: Additional questions may appear based on your answers. District administrators may reach us here. This survey is confidential. We do require the name of the school district. Was the student found eligible for Special Education? Is English the primary language in your home? Are all written materials and forms offered in the primary language of your home? Were you told that you are entitled to have an interpreter at the IEP meeting at no charge? Was there an interpreter at the IEP meeting? Did you pay for the interpreter? Does the school district use simple and commonly understood words in notices and during meetings? Were you asked if the meeting time and date were convenient for you? Did you receive a written meeting notice with the purpose, time, date and attendance list at least a week before the meeting? Were there any school evaluations or assessments discussed at the meeting? Did you receive a summary of the results, or the entire report, two or more days before the meeting? Did you request to see the results before the meeting? When you arrived at the meeting, was there anyone in attendance who was not on the attendance list? Were you told you could ask them to leave? If you expressed dismay they were there, or if you asked them to leave ... did the unexpected person leave? Was anyone on the attendance list but not at the meeting? Was there a proper substitute person? Such as a different teacher who knew your child as well. Were you asked at the START of the meeting if you agree to excuse the person? Did that person submit a written report for the Team to consider in their absence? Anything to add about missing participants? Were there proper introductions of everyone in the room? Is the student 14 years old or older? Was the student formally invited to the meeting? At what point in the meeting was transition discussed? Is the student in any general education classroom during the day, or was expected to be in the future? Was a general education teacher at the meeting? Does that general education teacher know the student? Did any Team member leave the meeting early? What is the role or position of the Team member who left early? 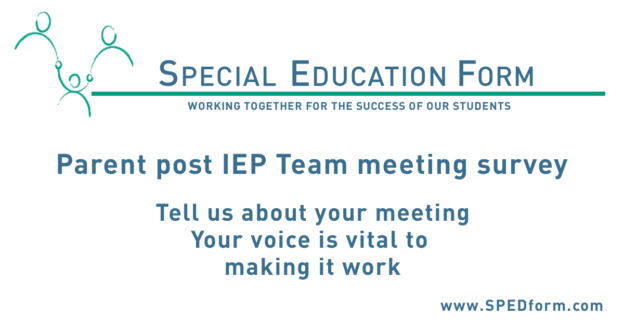 Did you feel a part of the Team when the Goals for the IEP were discussed? Do you think the Goals were pre-determined before the meeting and not able to be modified? Any other thoughts on not feeling as part of the Team concerning the Goals? Did you feel as part of the Team when the Services were being discussed and decided? Did the Team leave open the amount of any service in order to check with the administration? Were any services not provided because they are not offered in or by the district? What services were not added to the Service Grid page because they are either not offered by the district or the Team Leader needed to discuss with others? Was there a discussion of "Related Services" such as nursing or transportation? Were any related services turned down or the discussion put off because they are not available in the district or there must be a discussion with people outside the Team? What related services were not available or not fully discussed? Does the school want to have additional evaluations or assessments? Were the evaluations or assessments fully explained as to what they look for and how they are conducted? Was there a discussion about after school or extra curricular activities? Did the Team decide the student needs Extended School Year services? Were the services only offered during a set period of time that the district offers ESY or did the Team discuss the potential for individualized services? Was there a discussion at the end of the meeting about "Placement"? This means the type of classroom, amount of inclusion, and potentially the location. Did you feel you were a Team member and part of the discussion? Do you feel the decision on Placement was pre-determined? Did the others decide before the meeting? Were you presented with a Placement Form that was already filled in? Were any boxes checked? Or the name of a school or program was already entered on the form? What would you like to add about Placement? Were you offered a copy of the Parent's Rights and Safeguards? Before leaving the meeting, were you given at least one copy of the "Proposed IEP" which is the document ready for you to sign? Some Teams give the parents the Proposed IEP at the end of the meeting and all that is needed is a signature, no waiting for the document. Were you given a summary or marked up copy of the IEP that clearly stated a summary of each goal (or the complete goal) and ALL the services determined? Did you specifically request to receive the Proposed IEP within 3 - 5 calendar days? Have you received the Proposed IEP to sign? Was there enough time for the meeting? Overall, did you feel that you were an equal part of the Team? What are the most POSITIVE aspects of the meeting you would like to share? What are the most NEGATIVE aspects of the meeting you would like to share? The following information is optional. The data from the survey will be mixed with other surveys and there will be no individual identifying information. We will not share your name or email with any other entity, including a school district. We are not a part of any school district.